It was a somewhat miserable, cold and clammy weekend, but that wasn't going to stop me from getting more yard work done. I got up early and headed up to American Soil & Mulch to order 10 yards of triple shredded pine bark mulch delivered, and also filled up the truck with a yard of compost blend garden soil. They were slow so the delivery truck followed me home. I started up the rototiller and tilled up the clay in the front corner of the wild area, where the figs and camelia used to be. I had already removed most of the legitimate soil from this area, and mounded it elsewhere. After I tilled the clay, I emptied the entire cubic yard of compost blend soil, spread it out and tilled this in, making for a nice mix to plant stuff in. I also mounded it up away from the sidewalk and driveway. I also decided to use my leftover landscaping blocks to build a nice little wall - the very front corner of the wild area would make a very suitable location for our succulent garden. So I removed pretty much all of the soil here, dug down into the clay and removed some of that, then Adrienne and I filled it in with a mixture of black soil, sand and gravel. We mounded it up nicely for drainage then Adrienne planted all of her succulents. 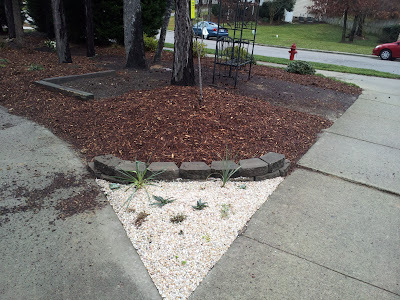 We finished it off by mulching it with pea gravel. Here's a picture of the finished area, including a Black Cherry Tree that we planted (which you can probably barely see because it's small and has no leaves or anything yet). Succulent garden and newly planted Black Cherry tree. You can also see a partially finished raised garden bed that my daughter insisted on for strawberries. I don't know how well this location will work for strawberries but we'll see. The soil should be well drained and rich especially after we build it up a little more. I just need to get some more 6x6 lumber to finish squaring off the bed, which will be about 4'x4'. The other thing worth mentioning is that I used some extra 8 foot 6x6 lumber to square off the garden bed in the wild area - sort of like a retaining wall. In this area I also planted a "Black Mission Fig" which I picked up at Home Depot yesterday for $20 - they are hardy to Zone 8A and we're in 7B so it may not last! I also replanted another one of the knockout roses here, and Adrienne wants to put a bird bath in the middle. 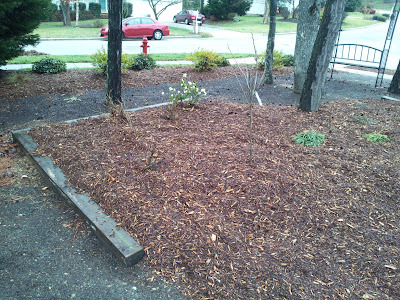 I also did a LOT more mulching and some weeding. Didn't really do anything in my "gardens" proper, but I figured that was enough for one weekend. Seed Starting Schedule - Start Planning Now! If you're planning to start any or all of your gardening items from seed this year, now is the time to start planning your planting schedule! In fact, depending on your location, you might be behind the ball already. Johnny's Selected Seeds has a really nice seed starting calculator to get you started. You simply enter the date of your last frost, and it gives you indoor seed starting dates and outdoor planting dates for transplant. I created an Excel spreadsheet containing all the things I would be planting, along with the first seed starting date and the first "set out" date that the seed calculator gives me. Then, Some seeds that I have were not listed (some of the herbs, for example) so I had to do a little extra research. I then made a few adjustments to the schedule so I was planting certain things at the same time, and I've scheduled almost everything for a transplant date of April 27, which is one week after my last frost. This allows me to set things out early if I need to (if they are getting too large for their starting container). 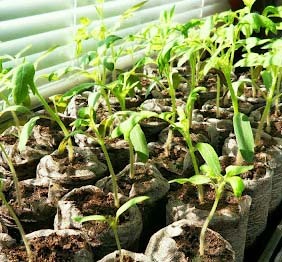 It's okay to set out transplants early as long as you keep them protected from the possible cold. LAST WEEK - plant Thyme and Foxglove. I'm a little behind on the Foxglove, I will plant that Monday probably. February 24 - Plant eggplant and peppers. These items will not be planted outdoors until May 4th, and this will give them 10 weeks to get established. I will start them in small peat pellets, and transplant them into 4" pots after about 6 weeks probably. March 2 - HERB DAY! I will start Parsley, Mexican Mint Marigold, Catnip, Oregano, Chives, Cilantro, and Dill. March 30 - Cucumber, Pumpkin, and Zucchini, along with my two flowering vines, Morning Glory and Cardinal Climber. I've already direct sown my lettuce, spinach, green onions, and yellow onions under a cold frame in one of my raised beds, and my peas have already been sown in another raised bed. I will also probably direct-sow my carrots sometime in late February (NC State says I can plant them from February 15-March 1). So, aside from getting my Foxgloves started ASAP, I have four big planting dates - February 24, March 2, March 16, and March 30.